Dynamic laser interferometer for on-machine and remote operation. 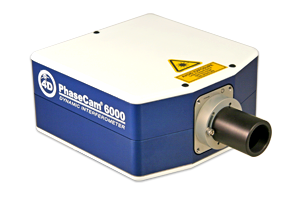 The PhaseCam® 6000 is 4D's most compact and lightweight dynamic laser interferometer. With an easy-to-position, fiber-coupled measurement head and motorized controls, the PhaseCam 6000 is ideal for on-machine metrology, remote mounting in measurement towers or pressure vessels, and other challenging environments. 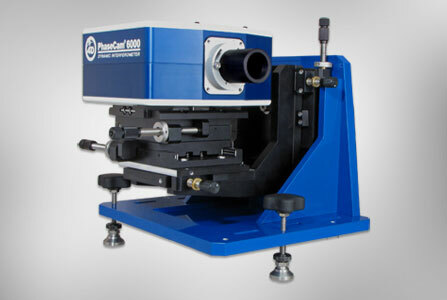 The PhaseCam 6000 dynamic laser interferometer incorporates a high-speed optical phase sensor that makes wavefront measurements in as little as 30 microseconds—over 5000 times faster than a phase shifting interferometer. Such short acquisition time means the PhaseCam can be used in the noisiest environments, without vibration isolation or turbulence control. Applications include measurement of large, focal optical systems such as concave telescope mirrors and lens systems, as well as deformable mirrors and adaptive optics. Numerous accessories and options are available including a 5-axis mount, low-reflectivity diverging lenses and beam expanders. Wavelength options include 532nm, 633nm and 1064nm, so you can choose the Dynamic laser interferometer that is tailored to your application. 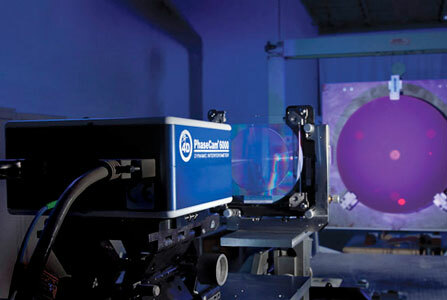 PhaseCam 6000 measuring large aspheric mirror. Courtesy Optical Surface Technologies, Albuquerque, NM.